My name is Molly, and I am an information junkie. I started using information to feel good about myself and to make myself safe when, in the first grade, I received an “A” in Phonics. My parents were incredibly proud. From that moment on, I consciously sought out information. I made it a point to consume some daily. To the outside world I appeared precocious, studious, disciplined. On the inside I was becoming an addict. In the mid 1980’s I achieved a sort of balance. I managed my habit, using only at work, where I consumed computer and software manuals along with business and technology magazines. There were slips, like the week I read an Andrew Greeley novel at my desk while pretending to be studying typography. But by and large, I kept things under control. The maintenance phase of my addiction continued through the early 90’s with occasional binges when I changed jobs or learned new skills. My tenuous equilibrium was shattered by the Internet. Overnight, I became an out and out junkie. I checked email at 3:00 a.m. I downloaded (and printed) manuals, documents, and educational materials. I was raking in information faster than I could consume it, and storage became an issue. Yet, mad as it may seem, I continued. My only concern was that there was so much information that was getting away. What if I needed it someday? What if it became scarce and expensive before I collected it? I was now blindly addicted to hoarding information, irrespective of its relevance or of my own capacity to digest it. Once or twice a year I would surrender, my spirit bent under the burden of so much information. I’d sort through the stacks of print-outs, and, averting my eyes, throw reams of paper into the recycling bin. I’d make binders for the reams that I felt I might really “need,” and I’d make a folder for the stack I considered priority reading. Usually this was recycled six months later, unread. As soon as I cleared away enough information that I could breathe, I was off again. This cycle has repeated itself at least twice yearly since 1995, though, with time, I have learned to store documents in temporary files or on two 150-gigabyte external hard drives. These days, I only print out “priority reading” materials, which reside in eye-catching red folders, enduring the fruitless transfer from desk to bedside to briefcase to desk many times, before, dog-eared but largely unread, they too are recycled. I’m tired of living like this. I want to go back to the times when reading was a joy, when I’d spend an afternoon with a book of poems instead of briskly riffling the pages to find “something good.” I want to be challenged, moved, engaged, outraged by what I read. These days I too often feel simply overwhelmed. My wise friend Arlene Hetherington once mused that there is more than one way to live in scarcity, and that hoarding information can be as harmful to the soul as hoarding money or time. I, for one, am sure that she was correct. So it is that I share with you that my name is Molly, and I am an information addict. Last night I truly wanted to learn something about the Enneagram. I went into my office intending to get a single book, looking forward with clear intention and a sense of lightness, to connecting with (rather than decimating) its contents. Before I left the office, I had 12 books in my arms. To my credit, I put eight of them down and took only four up to bed, still the act of selecting (or not selecting) had stimulated my gluttony, and by the time I was ready for bed, any authentic appetite was gone. This morning I drove home from my swim in Puget Sound, a ritual that restores me to sanity, intent on abstaining from information acquisition. When I stopped at the post office, three books were waiting for me. At home, I found a gift from a dear friend on my porch. Yes, it was a book. At the office, I found two notices to pick up holds at the library in my email along with five not-to-be-missed newsletters that will reside in my “to read” box until I delete them unread. And oh, there was a note from Integral Naked to upload the latest audio, a quote of the week from Andrew Cohen, and another quote from Chogyam Trungpa. And then there was the notice to download this week’s New Republic, and several listserv messages that could be worth saving. It appears that the path of information abstinence will be neither straight nor smooth. Wish me luck. You article on being an information junkie rings true for me too. It is only recently that I have realised that it is pointless collecting information that I intend to be read later. And then never getting time to read it because I am too busy searching out new facts and figures! I never had thought that I may be suffering from “Information Scarcity Syndrome”. Do you know? I suddenly feel quite at a loss. This is definitely something I need to work on. Back when I wrote that post I more or less stopped ordering books, prnting articles off the Web, etc. I did click on links to intriguing articles at Salon, but rather than printing them, I’d click the “print” button to bring up the full texts. I’d do this in separate tabs for as many articles as I thought I might want to read, then I’d minimize that browser. That way I could read these pieces offline, or not, without wasting paper. Sooner or later I might quit the browser with articles unread — no loss. Anyway. This week I saw two books lying on the table at the house in San Miguel. One, What’s the Matter with Kansa? looked like it might have a fresh take on the debacle that passes for political discourse these days. The owner had finished the book, and he gave it to me. I’m looking forward to reading it. Reading, like eating, is best done on an empty stomach. Alas! I have cohorts on the over-crowded information highway. Not only can I not bear to misplace something which I have so diligently printed and filed away for future reading, but my inbox remains a constant reminder of all the helpful newsletters to which I subscribe, reminding me that life somehow got in the way of completing my well-intentioned quest for more information, more knowledge, more insight, more, more, more…. I’m unable (read: “unwilling”)to let go. I must tell you, Molly, that you are one of my steadiest, most reliable suppliers. Yours is the one newsletter that hasn’t been relegated to my spam file, almost always gets printed, and more often than not, even gets read. For a while, I was cutting and pasting it into Word, enlarging it to 18-point type, and printing it out so I could read it while I was walking on my treadmill. I’ve since become “treadmill sober,” but I’m still deeply mired in my information addiction (Molly Gordon productions being my drug of choice). I’m expecting 4 more books in tomorrow’s mail . . . which will soon be pre-empted, only partially read, by new additions to my stash . . . which, in turn, will also be pre-empted, only partially read, by even newer additions to my stash . . . which will be . . . you get the picture. Though I love using, I find the high lasts only slightly longer than the act itself. Though I continually vow to remember the content of my choicest “hits,” often posting quotes from them around my house for memory’s sake, I cannot recall most of what I’ve ingested. That being the case, I’m not sure why I continue to use. I can only conclude that the addiction has a nasty hold on me, and I’m too hooked to even care about trying to get the monkey off my back. Still, it’s comforting to know that I am not alone. In fact, I had no idea that there were others out there battling the same affliction. Some day, perhaps I’ll hit bottom so hard that I’ll be willing to withstand the pain of withdrawal. Till then, I’m hopelessly hooked. Too, too, funny, and all too true. We are kindred spirits, Suzanne. I can’t claim to have beat my habit — they say you’re always in recovery! — but I do have some tried and true strategies for detoxing. 1. I accept that from time to time my healthy appetite for knowledge will devolve into compulsion. 2. I let go of the fantasy that I can live without information and knowledge. Utter and complete abstinence is not an option. 3. 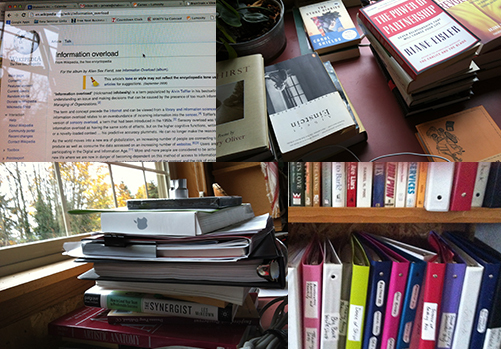 Therefore I decline to beat myself up (well, sooner or later I decline) when I discover that I am once again consuming information compulsively. 4. Each time I discover that I have crossed the line from using to abusing, I learn a little more about the danger signals. You could say that my bottom gets higher with each experience. 5. Since I don’t beat myself up (much), I can get right to recovery when indicated. 1. Let myself really experience what information glut feels like. Notice the bloated sensibilities, the sense of pressure, the feeling that time is always too short and my brain too full. When I fully experience my discomfort in the moment, it awakens a desire to self-correct. 2. I wonder about what I’m believing or pretending such that I continue to gorge. Am I afraid that I must know more in order to succeed? In order to keep my status? To distract myself from something? 3. I wonder about what hunger would feel like. What would it be like to have an appetite for what I am reading as opposed to a compulsive craving? What would a complete and satisfying information experience look and feel like? 4. I repeat these strategies of acknowedgement, acceptance, and awareness until my desire for freedom outstrips my compulsion. Then I take a leave of absence from information — I give myself a break — with a clear felt sense of how I will know when it is time to “eat” again. Here I am, writing replies to posts when I *ought* to be working on something else! I wonder if there is some relationship between the addiction to acquiring info and the attraction to making connections with others… Like you, there is much I »ought» to be doing…well, actually, I ought to be sleeping! Here I am, musing on, and writing about, the idea of info junkies who like to feel the flow in both directions! OMG! I was laughing til tears were running down my face! Molly you just described me! All the way down to the folders and binders!! I call myself a “Book ho” I can’t go to a bookstore without buying – I have lists of books I need to read in a folder in my email, I have a bookcase full of books I have yet to read, I’ve read most, but there is still a substantial pile left – then I buy more books. I’ve weeded out my ezines, I like you, end up deleting unread stuff…Thanks for giving this a name and making me laugh my *&& off this morning! Lovely post and thanks for the re-post. I’m an Enneagram teacher, therapist/coach and am curious about how your “information gluttony” keeps you in your type’s “box?” Why your need for information, to know, and keep up with the latest stuff? It’s a great question, Anne. I can readily see how information gluttony can keep any of the types in their boxes. I’m a six, and one way it plays out is by feeding my tendency to second guess myself. Hi Molly, Looks like you have working on this since 2005??? Or, how did those folks comment on November 10th and 11th?? However, I am a book junkie for many years and have spent alot of life energy organizing my information finds. Sometimes I wonder if I have ever used the information I accumulated–but I had fun doing it so WHY NOT?? A few weeks back I “unsubscribed” to several ezines, but I am back because like yours they make me smile to read and encourage me to think about my own work. So, I will continue to collect your ezines, organize them into my notebooks and be extremely glad to see them pop-up in my email box. It is a wonderful life–yes? Yup, this was a revisitation of an older post, Jean. From time to time I unsubscribe, give books to the library, take apart the binders and recycle the paper. It’s a cycle. I love learning, so I don’t actually want to stop gathering information. It is good though to have the choice to back off and regroup sometimes. i truly, truly wish you luck sister junkie . . .
Much love and appreciation to you, Coease! Input is one of my strengths alos, Dana. Don’t you often find that strengths and weaknesses exist along a continuum? hat’s certainly been my experience! My name is Linsey and I am an information junkie too! You eloquently described this disease, and I’ve certainly learned some new insights and strategies for managing it better. I guess I’m happy to have company here. Thanks for the post Molly. It really is nice to know there are more addicts out there then one of my classmates and myself.She categorized the problem as having anything printed that you haven’t looked at before throwing it out or recycling it! You should see my den and living room (or maybe not! ), as for my office where did I put that stack of folders. Oh well, my addiction could be worse, having dealt with drug addicts, I am grateful it’s only a book and paper obsession ! Loved your description of your relationshp with reading. I share a similar relationship. I was reminded of the week in The Artist’s Way when we are invited to go without reading. It was a “quieting” experience in my mind, not necessarily easy at first, but eventually calming. Thank you for pointing to this wild hunger we share. I tried to cut down on the space problem by getting a Kindle. But I don’t like it at all – I seem to need the physical feel of pages and the sight of real volumes on my shelves, on my desk, next to the bed, by the couch, etc., etc. When asked once what I would want most to save in the event of fire, my first thought went to my books! It certainly does look like an addiction, and I do find myself becoming compulsive with my reading. Yet I positively adore reading (with definite preferences – I am selective) books, articles, poems, even certain quotes – and I am grateful for every morsel! I truly enjoyed your sharing of this with us. Wow! And, Thank You! Well, you have probably just helped me rein in my attraction of free material of all sorts, so that I can have greater focus on what really matters to me, and thus have clearer direction of my energy and thought, and movement forward. Within this, your story revealed some good insight as to indicators for me to notice. My peeps – so glad to find you! I’m definitely a book addict. I live for Audible. Kindle is my drug. I’m reading 3 books now on it. Just got a new book from the library & awaiting another; I wanted to kick it old school & touch the pages. I find when I’m reading this much I’m enjoying it but it’s also an escape. The more I learn the less time I have to do, interact, have actual experiences- live. It’s a dilemma. Thanks Molly. You’re my new girl crush, right after the Beer Chicks.